Stop by one of Great Southern Equipment's locations across Florida to see our selection of Sakai compactors. Sakai rollers have a long life and consistently outlast the competition. With heavy duty parts and a patented shock isolation system, these machines are an excellent long term investment. 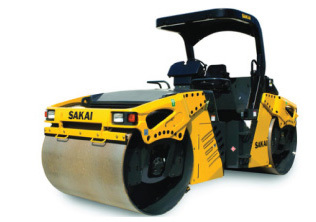 Sakai offers a wide range of asphalt compactors from 33" width rollers perfect for road shoulders and parking lots, to larger models that quickly finish work on highways and airports. 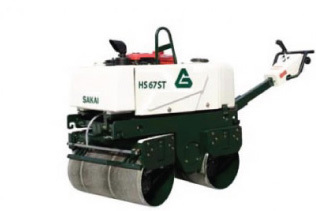 Asphalt rollers from Sakai are also extremely versatile. Many models offer oscillatory and vibratory rollers with variable amplitudes and frequencies that can quickly be dialed in from the operator's station for perfect compaction in any setting. For unmatched durability, Sakai's line of soil compactors features the same heavy duty parts and shock isolation system as the asphalt models. These rollers feature high centrifugal force outputs and several amplitude and frequency settings to achieve uniform compaction and reach target density in fewer passes. Traction control and raised exhaust pipes for trench work mean these machines can handle any job including slope work, utility installation, and site prep. Sakai soil compactors also feature a new ECO compaction mode to reduce fuel consumption by up to 20%. Versatile and durable, Sakai offers light compaction equipment for your small, confined compaction jobs. These machines offer superior shock absorption systems to lower vibration for the operator. 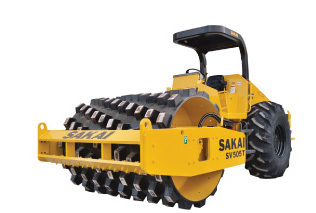 Sakai offers rammers, plate compactors, walk behind rollers, trench rollers, and ride-on vibratory rollers. These machines are ideal for trench work, utility projects, and landscaping.